A report in 2010 reported that if people in other parts of the world were to live the way the Singaporeans do, we need six planets for sustainability. 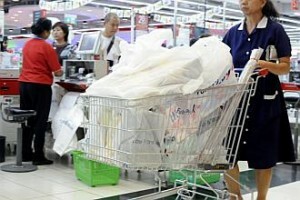 The average Singaporean throws out 860g as of 2011 of waste a day (zerowastesg.com puts it at 1330kg/person/year!) a third more than places like Taiwan and Germany) according to Environment and Water Resources Minister Yaacob Ibrahim. Cars are only allowed to be used every 10 years. Even if the conditions is very good, you have to “scrap” it. Because of the tax structure, there were times where a 2-3 years old cars was scrapped as people took advantage of the tax advantages. Buildings are torn down frequently. As a result of cheap labour and escalating property prices, cost of tearing down a building is often cheaper than go find an empty plots to develop it, never mind if the building is still very good conditions. En-bloc sales are common for private properties and in the case of public houses (aka HDBs), it is common for a building to be torn down after 20-30 years to make way for higher and newer buildings. E.g. the Atria At Meyer completed in 1996 (15 years old) are in discussions to sell en Bloc. Notice a lot of lightings in residential and commercial areas? Every floors and walkways in the residential buildings are litted well into the night to provide the sense of security. People change their mobile phones, TVs and computer every two-three years, creating lots of electronic wastes, a by-product of affluence. Almost every household hired a maid since it is cheap to hire one (even a humble clark or driver will have hired one), so what do maids do, they clean the houses, windows, floors, cars almost everyday. And since they are measured by cleanliness and works they do, wasting of water or electricity are very common. I notice my utility bills drop by more than half each time my maid goes back for home leave. Ever wonder why all buildings in Singapore look so new. Thanks to cheap labours, Town council regularly refresh the paint of the HDBs exterior and tearing down old facilities to build new one. Where does the money comes from? Every households in Singapore contributes average $50 per month to a pool which will be used for “maintenance” including wastage as such. According to Todayonline: Singaporeans’ penchant for upgrading and pride in their homes have propelled them to the top ranks of paint consumers in the world. The republic uses an average of 47kg of paint per capita – among the highest in the world, according to research firm IRL’s profile of the Asia-Pacific paint industry published last June. It is expected to use 307,200 tonnes of paint by 2014, up 40 per cent from 2009. As a result of more than 95% of the population stay in flats, the traditional ways of “recycling” such as collecting rain water, sharing the leftover food with pigs,dogs and cats, reusing used containers for other uses, burning of papers or dried branches for cooking are not possible in flats. Resulting in even more wastage. Singaporeans are pampered with airconditioning. From almost non-existence just 30 years ago, now almost all car, buses, trains, houses, shopping malls, offices, hospital and even Schools and Army facilities are fitted with airconditioning, a device that require high electricity consumption. Not only does modern buildings do not bother to design using natural air for cooling and vegetation for shade, the temperature in many buildings are so cold that people are wearing sweaters to stay warm. How wasteful is that? You see escalators everywhere in Singapore. Every MRT and shopping mall come with lots of escalators. Even some small elevated platforms with less than 1m height comes with escalators both ways. You can see one from at the Promenade MRT nearer to the main entrance at Suntec. I do not see such luxuries in the Subways/Metros of many European cities, Hong Kong, Guangzhou, Beijing, KL, Bangkok etc. You just need to try to climb the stair, it is good for your body and it saves a lot of electricity. Lastly my biggest bugbear, the indiscriminate use of plastic bags. As a result of inaction by the Government to levy taxes on the plastics bags, you often seen people asking for more plastic bags rather than fewer since it is “free”. People do not bother to carry recycling bags and refuse to reduce the usage of plastic bags. The standard practice of all stall holders is to put purchased item in a plastic bags unlike in China or developed nations, this is one area that Singapore still has a long way to catch up with their newly acquired affluence but irresponsible attitude. The government has to do more to introduce various taxes to discourage the use of plastic bags and other wastage. More importantly, Singapore should look into having a comprehensive plan to recycle as much as possible. A report recently has quoted that the recycling rate in Singapore is a pitiful 20-30% way below many developed nations. For example, NEA had quoted in 2009 that the recycling rate for food was 13% and plastic bags was 9% in 2009. The overall recycling rate in 2009 was 54%, if industrial recyclables from construction waste were excluded, the household recycling rate would sink to such a low rate it would “stick out like a sore thumb.”. One area that NEA has done well to control wastage and pollution is the legislation which makes it illegal to leave vehicle engine running while stationary which is a common sight in singapore. To report violation, just call 1800 CALL NEA (1800-2255-632). SINGAPORE’S rising food wastage weighs heavily on my mind (“More food going to waste”; last Wednesday). I am the co-founder of Food Bank Singapore, which channels excess food from supply chain stakeholders – such as manufacturers, importers, distributors, retailers and even domestic consumers – to the agencies that service the needy and hungry. While the demand for food has always been increasing, our donations have been relatively ad hoc, with many players in the industry preferring to dump food instead of donating it due to concerns over liability and branding issues. With Singapore importing more than 90 per cent of its food, I am saddened to hear of such practices. Not only are we throwing away precious food, but we are also wasting the packaging (for example, tins, paper and cartons) and the “fuel” used to produce and ship the food to us. Why is it that people have to spend hard-earned donations to buy food when there is so much in the food chain that we can salvage? We are not even talking about goods close to expiry but food that needs to be discarded because it was not produced to specifications, or because specific promotions did not take off. Being a First World country, Singapore needs to take a look at what other countries are doing with regard to this issue. From supermarkets donating damaged or excess food, to food rescue programmes at the food and beverage level, there is plenty we can do, albeit with some government support. Is there a possibility of establishing a good Samaritan law where donors are free of liability when they donate food products? Or perhaps some tax incentive when companies make food donations, just like how a cash donation works? Both the cost of food and the amount of wastage will continue to rise if we do not start taking action, as both issues are closely linked. Do road cave-ins suggest we are testing nature’s limits through over-construction? Big push needed to make recycling a norm (2 Jul 16) – At the root of our dismal household recycling rate is the apathy and indifference of Singaporeans, and the lack of a good push from the Government. Eco-conscious Singaporeans’ zero waste way of life – kudos to these green warriors! They take their own cutlery, containers and water tumblers when they go out. They avoid straws, plastic bags and food packaging. Some have a compost bin at home where they dump their kitchen scraps and use the compost to fertilise plants…. These are just some measures adopted by members of the Facebook group, Journey to Zero Waste Life in Singapore, which seeks to reduce waste in daily lives. Why are few Singaporeans going green? SINGAPORE families are dismal when it comes to recycling and using energy efficiently, so much so that the Environment and Water Resources Ministry is seeking the help of experts to change their habits. Consultants are being asked to carry out two studies to find out why people do not do what they should and set out an effective communication strategy to coax them to change their ways. One is on recycling, and the other, energy efficiency. Tender documents obtained by The Straits Times stipulate that both studies have to carry out a face-to-face survey of a representative sample of 2,500 people from the five community development councils. The surveys will help pinpoint the specific behaviour to adopt, identify the best group of residents to target for change, as well as set outand monitor a communication strategy to encourage them to pursue the desired behaviour more often. Each study also has to probe beyond the commonplace explanations of why people do not do the right thing, ‘by looking beyond notions of laziness and inconvenience’, said the tender. The recycling study has to focus on the recycling of glass, plastic and paper in households, it added. These items account for 53 per cent of domestic waste each year, falling far short of their potential to be recycled. For instance, up to 90 per cent of paper tossed out by households could have been recycled, but only 52 per cent is. Such recycling is crucial as Singapore has limited space for landfills. For instance, the landfill island of Semakau, which takes in ash from waste incineration, is expected to meet the country’s needs only till 2045. Also, the recycling rate for all waste has some way to go to meet the target set in the Sustainable Singapore Blueprint. The goal is for a rate of 65 per cent by 2020 and 70 per cent by 2030. But last year, it was 59 per cent. Worse, in categories like plastics, it was a mere 11 per cent, and for glass, 29 per cent. As for energy efficiency, the study is targeting the use of air-conditioning at home as it accounts for 30 per cent of a household’s energy use. A few days ago, I was at the PC Show. Since it was the final day and every booth was trying to clear their stock, it was a rather messy affair. Walking around, I saw heaps of brochures and flyers lying on the ground and dumped into bins (picture). I was appalled and found it ironic as many companies claim to be eco-friendly, selling energy-saving and environmentally-friendly products – but this seemed to be exactly the opposite case, what with the amount of colour-printed paper wasted. I wonder what the companies do with all the unused brochures? I would suggest that organisers of future shows consider putting out recycle bins for people to dump unwanted flyers. I also urge companies to cut down on wastage by better estimating the number of flyers to be printed. This would better reflect on the environmentally-friendly labels such companies claim as their own. Why destroy natural habitat when other land available? I REFER to the debate over the conservation of Bukit Brown. Let us not take into account the heritage value of Bukit Brown in this discussion. After all, we have bulldozed other national monuments like the old National Library despite their sentimental value. There is also no operational value in “Bukit” Brown, which reportedly stands at only 1m above sea level. Neither is it exactly in the Central Catchment Area, being excluded from it by Lornie Road. The question is, why destroy this green area at the heart of our island when it is not the only place in Singapore left to develop? It is, after all, a pristine, untouched ground since it has been used as a cemetery. As former Minister for National Development Mah Bow Tan noted, the next two areas to be developed are Simpang and Tengah. These two areas have been trampled by National Servicemen and their value as a nature reserve is no longer high. A huge plot of land also remains available in Punggol West. It is a sparsely populated private housing area and not an untouched natural habitat either. So as we can see, there is no shortage of land in Singapore for housing. These three plots of land can easily sustain a substantial number of residents, and using these plots would not really compromise Singapore’s natural habitats since they have already been interfered with. Already we are not far off from the projected 6.5 million population. Do we really need that many more flats? Besides, we can make up the numbers with the Selective En-Bloc Redevelopment Scheme in selected estates. Why touch a prime natural habitat when there is no urgent need to do so? I urge the authorities to reconsider their plans to develop Bukit Brown. After all, readers have remarked that we need these green lungs in the heart of our island to prevent the flood waters from rising. It remains to be seen, pending further research by the floods panel, whether this is indeed the case. WHILE living in Shanghai four years ago, I was amazed at how resolutely the authorities ended the use of plastic bags. The city’s populace quickly adapted and most people began carrying their own bags whenever they went shopping. A similar ‘ban’ has been successfully implemented in other Asian cities as well in the last few years, including Hong Kong and Penang. It baffles me that Singapore has done little to curb the use of plastic and to really embrace the 3Rs of Reduce, Reuse and Recycle. There are two national icons that can lead the way in making a difference in turning Singapore into a greener nation. The first is national carrier Singapore Airlines. On a recent flight, I was appalled at how much unnecessary waste was being created. These included paper menus and toiletry bags that were given to every passenger. Yes, these were nice touches, but certainly unfriendly to our environment. SIA should stop giving out these bags, and consider featuring menus on the individual KrisWorld screens instead. The second icon is NTUC FairPrice. Every time I shop there, I am amazed at the myriad number of bags given out. Certainly, the bring-your-own-bag effort is so anaemic that no one seems to even take it seriously. FairPrice can set the pace by beginning to charge for bags instead of giving a paltry 10-cent rebate to those who bring their own. If our iconic institutions start taking ownership and leadership, they can help create a new green culture. It is time to awaken our environmental conscience. My wife and I have been staying here for the last four months. Singapore is a god-gifted country, with plenty of sunshine, rainfall and lovely beaches. But I am appalled at the water and electricity wastage. I walk regularly at East Coast Park, and it is common to see street lights switched on in broad daylight at 6pm. Wherever I go, whether it is the Mass Rapid Transit or at buildings, walkway lights are switched on in the day. As far as water is concerned, the less said the better. With global warming, it would not take long for things to change. But if the Government starts now on conservation, it would help. I come from a country (India) where both electricity and water is short, so I feel that Singaporeans cannot afford to take things for granted. Do we treat global warming seriously enough? Singapore enjoys a favourable geographical location that shelters it from serious natural disasters. It is highly unlikely that a storm like Typhoon Haiyan would hit the island in the near future. However, Singapore is not an isolated haven immune to climate change. The frequency of recent heavy downpours and flash floods is expected to increase as sea levels rise due to global warming. The city-state is renowned for its environmental management expertise and contributes less than 0.2 per cent to global carbon emissions. Still, is global warming treated seriously enough here? Although many Singaporeans find the air-conditioning in offices, cinemas, schools, public transport and other public areas too cold, is such energy wastage curbed? Consumption habits fuelled by a high gross domestic product per capita are common in Singapore. Food wastage amounted to 703,200 tonnes last year, up 26 per cent from 2007. And although water is a scarce and precious resource in Singapore, wastage is still high. We should really play our part to curb climate change, starting with our daily life. Otherwise, we may also be victims of environmental disasters eventually. Over the past month, I’ve become somewhat obsessed with a personal experiment called “Project Zero Waste” – that is, trying to live a waste-free life in Singapore. You’re probably thinking: Is that even possible? After all, Singapore’s roughly 5.5 million population last year generated – according to the National Environment Agency (NEA) – 7.67 million tonnes of solid waste. That works out to a mind-boggling 1,395kg of “stuff” each person on average threw away. So, a waste-free life here? Well, the answer is not yet, but there is plenty we can do to get closer to it. Project Zero Waste was inspired by the award-winning documentary Trashed, in which Oscar-winning actor Jeremy Irons goes around the world and puts the spotlight on beautiful ecosystems that have been blighted by filth, pollution and garbage. It got me thinking that the majority of people here give barely a thought to trash because the system makes it far too easy for them to consume and discard. Thanks to the ubiquitous rubbish chute, garbage here quickly goes out of sight, out of mind. For this experiment, I adopted a three-step strategy in order of priority: reduce consumption, reuse items where possible and recycle anything that could not be reused. Only as a last resort did I throw anything into the chute. The household recycling rate here is only 19 per cent. The writer also cited an ST report on how up to half of waste collected from recycling bins in housing estates go to incinerators because people dump trash like used diapers into the bins. I discovered first that it is easy to drastically reduce consumption of daily disposables by making use of a few simple items: coffee mug, water bottle, tupperware, tote bag(s) and handkerchief. In one month alone, those items helped cut my consumption by 50 plastic bags, 20 paper cups, 20 plastic or styrofoam food containers and countless disposable cutlery and bathroom tissues. Now, try multiplying that saving by 12 months and 5.5 million people and you get an inkling of what sort of impact such a simple step can have in a year. Second, the majority of household waste comes from food packaging. Nearly everything on sale in supermarkets is wrapped in plastic. The exceptions include some types of fresh vegetables and fruit. At wet markets, produce is more often displayed unpackaged but sellers negate any benefit by putting anything sold in plastic bags as a service to customers. Third, there is huge potential to cut household food waste by cooking just the right amount and by using raw food scraps to make compost. Contrary to popular belief, compost is easy to make, even in apartments, and more than half your food waste can be converted into free fertiliser. Fourth, recycling is actually not difficult. All my newspapers and magazines get recycled, along with any metal, plastic and glass containers at the bins at the foot of my apartment block. E-waste is more problematic as there is still no government regulation on its recycling and collection bins are, despite industry efforts, few and far between. For this, I make occasional trips to the StarHub e-waste bin located at a community centre near my home. Finally, I realised that as a society, we are generally ignorant and apathetic on waste issues, and that is largely a result of the infrastructural set-up and policies. Despite recycling bins being provided at all housing blocks, the household recycling rate here remains at an abysmal 19 per cent. A quick straw poll among my friends found that more than half of them do not reuse or recycle anything apart from newspapers. Many did not know that recyclables had to be rinsed, and most of them said they “don’t bother”. It’s one thing not to recycle but quite something else to thwart the efforts of those who do. Last week, within a minute, I spotted at least two persons dumping their lunch waste into recycling bins for paper, plastic and cans located at my office building. Last month, The Straits Times reported that up to half of all items put into recycling bins in housing estates go to incinerators because people dump trash like used diapers, food waste or soft toys into them. Incinerators – which Singapore favours – are also controversial. They have been linked to high levels of toxins where they are located and high cancer rates, a point highlighted in Trashed. Recently, I was served tea in styrofoam cups at, of all places, the Environment Building. I was later told by a government official that “it’s okay” because Singapore incinerates its trash and has pollution control equipment. That was also the reason given in Parliament when an MP asked if NEA would consider imposing a ban on styrofoam packaging. We need to realise that the use of incinerators is not licence to make and encourage the use of disposable items that pollute the environment and cost money to get rid of. Even recycling does not excuse the liberal use of disposable items. Across the world, it is typically more expensive for municipalities to recycle household waste than to send it to a landfill or incinerate it. Many communities fail to realise that reducing consumption and reusing items are far superior options to recycling. It seems to me that in Singapore, the search for solutions to the trash problem is focused on the wrong places. Instead of spending more and more on incinerators, shouldn’t we be pumping money into research and development to find ways to lower the cost of sustainable, biodegradable packaging? And besides setting the national recycling target at 70 per cent by 2030, shouldn’t we also be simultaneously setting targets to lower the absolute amount of waste generated? For years, the Government has favoured the soft approach of waiting for citizens and companies to voluntarily change their ways. But that is just not good enough. Going by the national data, it is obvious that public campaigns to educate people on waste have failed miserably. The Government needs to use its legislative power to design a system in which waste is minimised from the start. That includes rethinking how products are packaged, distributed and sold, and creating channels for customers to reuse and return used items. There should be more incentives for customers to take along their own bags or cups when they buy goods. Trash is of course not the Government’s problem alone but everyone’s. Waste is linked to carbon emissions, which worsen climate change. It also pollutes land and rivers, poisons the food chain and leads to higher rates of cancer and disease. The challenge is how to make people realise that. Perhaps an “SGWaste Fund” could be set up to support projects that help raise awareness of why waste is bad. Thankfully, there are many cities Singapore can learn from where the focus is on preventing waste, recycling and composting. San Francisco, for instance, has a goal of zero waste by 2020, and already diverts 80 per cent of its waste away from landfills. The city has banned plastic bottles, and the ban will soon be extended to all styrofoam products. Personally, I’ve decided to continue with Project Zero Waste. My wastebin in the past month has not been quite as empty as I hoped. There were days when I forgot to take my tote bags and got saddled with plastic bags I do not need. I am also acutely aware that I am but one person out of seven billion on this planet. But while I can’t control the behaviour of others, I can be responsible for my own. Will you care to join me? •The writer is the editor of Eco- Business, an Asia-Pacific sustainable business online publication. This is a monthly column on the environment.